[169 Pages Report] The overall sports medicine market is expected to grow from USD 5.41 billion in 2016 to USD 8.24 billion by 2022, at a CAGR of 7.4% from 2017 to 2022. 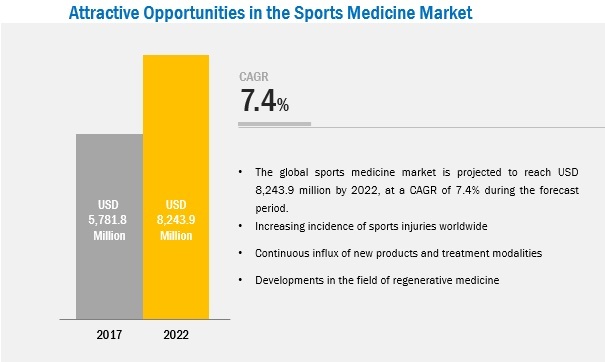 The increasing incidence of sports injuries, continuous influx of new products and treatment modalities, and developments in the field of regenerative medicine are some of the major factors driving the growth of the global sports medicine market. However, the high cost of implants and other devices is expected to restrain the growth of this market during the forecast period. The base year considered for the study is 2016, and the forecast has been provided for the period between 2017 and 2022. A number of sensors are incorporated in a vehicle to ensure the smooth functioning of its various parts. Almost all areas of automotive interiors use sports medicines for reliable and safe operations. The low operating power and long life of sports medicines make it ideal for use in various applications in the automotive industry. For instance, sports medicines are used in automobile sun visors, early brake sensing, exhaust emission sensing, power windows, fuel cap position sensing, anti-lock braking system, coolant flow sensing, defective lamp detection, low fluid level monitoring, visual indicators of battery life, seatbelt lock sensing, accidental airbag deployment prevention, door sensors in cars, cruise control, and power steering, among others. Therefore, the ever-growing automotive industry drives the growth of sports medicine market. 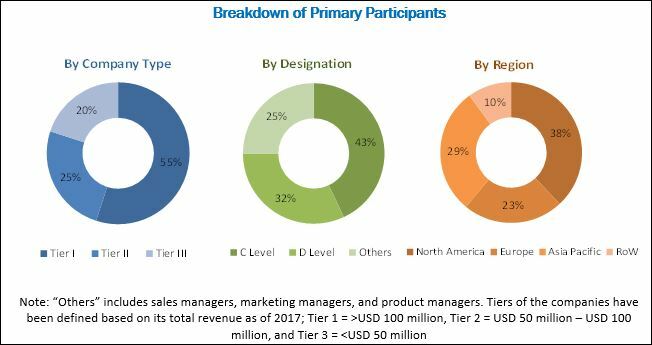 During this research study, major players operating in the sports medicine market in various regions have been identified, and their offerings, regional presence, and distribution channels have been analyzed through in-depth discussions. Top-down and bottom-up approaches have been used to determine the overall market size. Sizes of the other individual markets have been estimated using the percentage splits obtained through secondary sources such as Hoovers, Bloomberg BusinessWeek, and Factiva, along with primary respondents. The entire procedure includes the study of the annual and financial reports of the top market players and extensive interviews with industry experts such as CEOs, VPs, directors, and marketing executives for key insights (both qualitative and quantitative) pertaining to the market. The figure below shows the breakdown of the primaries on the basis of the company type, designation, and region considered during the research study. 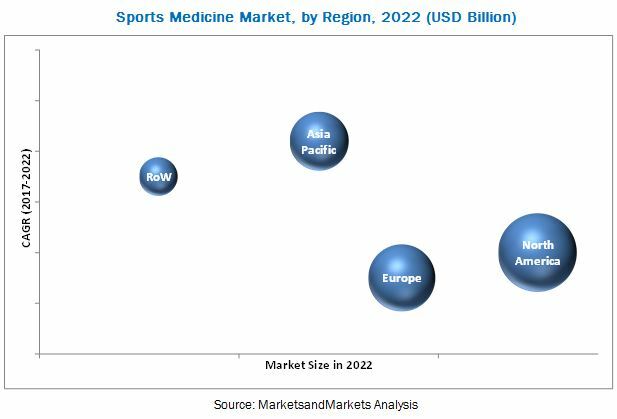 The sports medicine market comprises a network of players involved in the research and product development; raw material supply; component manufacturing; distribution and sale; and post-sales services. Key players considered in the analysis of the sports medicine devices market are Arthrex, Inc (US) Smith & Nephew plc (UK), DePuy Synthes (US), Stryker Corporation (US), CONMED Corporation (US), and Zimmer Biomet Holdings, Inc. (US). The 2017 partnership between Arthrex and Michigan State University College of Engineering and Medicine, US aimed at exploring and innovating new products for orthopedics. In July 2015, Arthrex GmbH Munich opened a new Department of Research aimed at innovating new technologies for the company. In January 2015, Smith & Nephew acquired DeOst and DC and the acquisition was aimed at boosting the company’s local presence in Russia. In October 2016, Smith & Nephew opened a new advanced medical technology manufacturing plant in Costa Rica. The new facility supports manufacturing of sports medicine orthopedic devices. What are new application areas which the sports medicine companies are exploring? The increasing incidences of sports injuries, continuous influx of new products and treatment modalities, and development in the field of regenerative medicine are the key factors driving the growth of sports medicine devices market. Sports medicine pertains to the treatment and prevention of injuries resulting from sports and athletic activities. Sports injuries involve both bone and soft tissue (ligament, tendon & muscle) injuries and sports medicine therefore includes devices that are used to cure & prevent sports injuries. The sports medicine market includes devices that are used for the prevention of sports injuries as well as for the cure, recovery and rehabilitation of such injuries. Implants, arthroscopic devices, and braces & support devices are used in various non-sports medicine applications. Therefore, only those devices that are directly involved in sports medicine have been included in the overall market. The sports medicine market has been segmented, on the basis of product, into body reconstruction products, body support & recovery and accessories. The body reconstruction products segment is estimated to command the largest share of 46% of the global sports medicine devices market in 2017 and is projected to register the highest CAGR of 8.0% during the forecast period. The high adoption of implants and arthroscopy devices by sports medicine surgeons and orthopedic surgeons for sports-related injuries contribute to the rapid growth of this market. The sports medicine market in APAC is expected to grow at the highest CAGR during the forecast period. APAC is the fastest-growing market for sports medicines. The growth in Asian economies, and healthcare reforms & investments in APAC countries has increased the growth of sports medicine devices market in this region. The increasing penetration of sports medicines and the influx of global players, along with the emergence of native players, are contributing to the growth of the market. As a result, APAC holds a significant share of ~16% in the overall market. Knee injuries are the most frequently occurring injuries in sports. Fractures, dislocations, sprains, and ligament tears are some of the most common sports-related knee injuries. Athletes who participate in sports like football and basketball are more likely to injure their ACL (anterior cruciate ligament). Treatment options for knee injuries include both non-surgical and surgical methods. Non-surgical treatment includes RICE (rest, ice, compression, elevation) to control pain and swelling in the knee. Also, physical therapy may be recommended to improve knee motion and strength and braces are recommended to immobilize the knee. On the other hand, ACL reconstruction is a major surgical treatment for ACL injuries, which tightens the knee and restores its stability. This surgery is performed with an arthroscope using small incisions. Foot and ankle injuries are one of the most commonly occurring injuries in sports such as football, basketball, and running. The commonly occurring foot and ankle injuries in sports include ankle sprain, peroneal tendonitis, fractures, plantar fasciitis, Achilles tendonitis, and shin splints. Acute lateral ligament disruption is a common ligament injury found in athletes. Depending on the injury to the ligament, there are two types of surgeries. In the first case, the injured ligaments are surgically removed and replaced. This process requires a shorter recovery period. In the second case, tenodesis is performed, wherein a tendon allograft is substituted through drilling holes between the ankle and foot bones. Furthermore, compressive bandages may also be used to immobilize and support the ligament. Elbow and wrist injuries are common in athletes where repetitive extension and flexion of the elbows and wrist is seen. Tendonitis and fractures are the most common wrist injuries in rowing, racquet sports, and golf, where there is a repetitive overuse of wrists. In the case of acute injuries, cold and hot therapy wraps play a major role in the healing of muscles and joints. These thermal therapy wraps increase blood circulation in the injured area and thus decrease inflammation. In severe and chronic injuries like tennis elbow or tendonitis, arthroscopy is widely used. The spine comprises three parts, namely, cervical spine (neck), thoracic spine (mid back), and lumbar spine (lower back), in combination with vertebral discs or cartilages. Lower back injuries are observed in sports such as running, golf, and weightlifting; whereas, upper back injuries are generally caused in sports such as swimming, golf, tennis, and skiing. Neck injuries are involved in contact sports such as football and rugby. Herniated discs, degenerative disc disease, spinal stenosis, and sciatica are the most common back and spine injuries in athletes. Other sports injuries include injuries to the head, face, and fingers. Concussion (traumatic brain injury) is the most common head injury in sports. It is caused by a temporary disturbance in brain function due to trauma. Moreover, the most common types of sports-related facial injuries are soft-tissue injuries and fractures of the T-Zone bones (the nose, the zygoma, and the mandible). The chances of suffering a facial injury are higher in baseball, football, softball, and hockey. Injuries to the fingers are also common in sports, particularly hand-ball sports such as basketball and volleyball. A jammed finger is the most common hand injury in sports. This injury typically occurs when a ball forcefully strikes the tip of the finger, transmitting a force up the finger to the PIP joint. Treatment of these injuries depends on their severity. Minor-to-mild injuries can be treated with RICE; whereas, chronic injuries require surgery for treatment. What are the upcoming industry applications for sports medicines? The high cost or orthopedic implants is a major factor restraining the growth of the sports medicine market. Orthopedic implants are used in various surgeries, such as knee and hip replacement surgeries and shoulder surgeries. However, the cost of these implants is a major concern for market growth in regions such as India, where only a small section of the population is under insurance coverage (according to the IRDA, in 2017, 76% of the Indian population was uninsured). Similarly, in China, even after achieving near to universal health coverage in the recent years, benefits are low, and the extent of care and coverage vary widely. Also, copays are often very high and out-of-pocket expenses are insufficiently reimbursed. With an overall average cost of more than USD 12,000 in other developing countries, affording such a costly treatment is still a big challenge for the majority of the population. Moreover, customization of implants according to the specific frame of the patient adds to their cost.